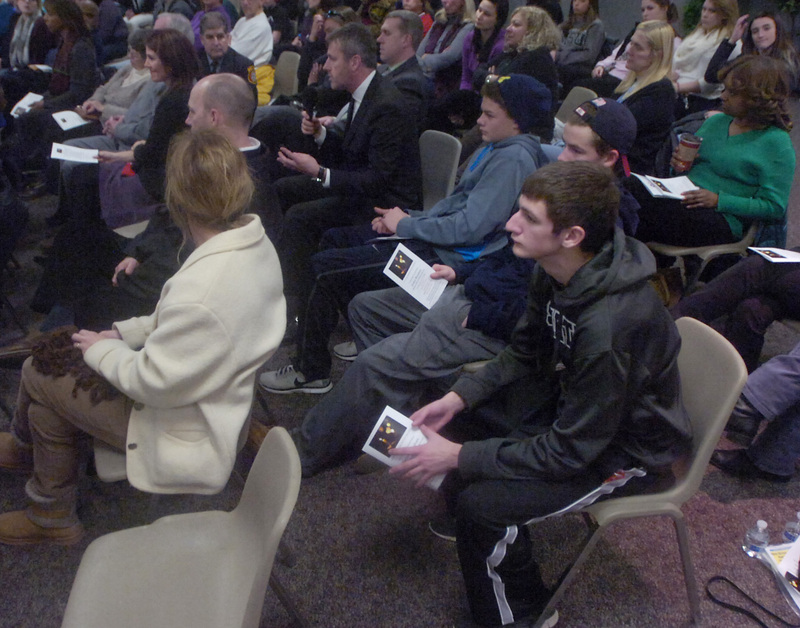 On Jan. 27, Farmington SAFE (Suicide Awareness For Everyone) sponsored an important community conversation. The goal of Farmington SAFE is to prevent suicide by erasing the stigma of speaking up about depression and thoughts of suicide. 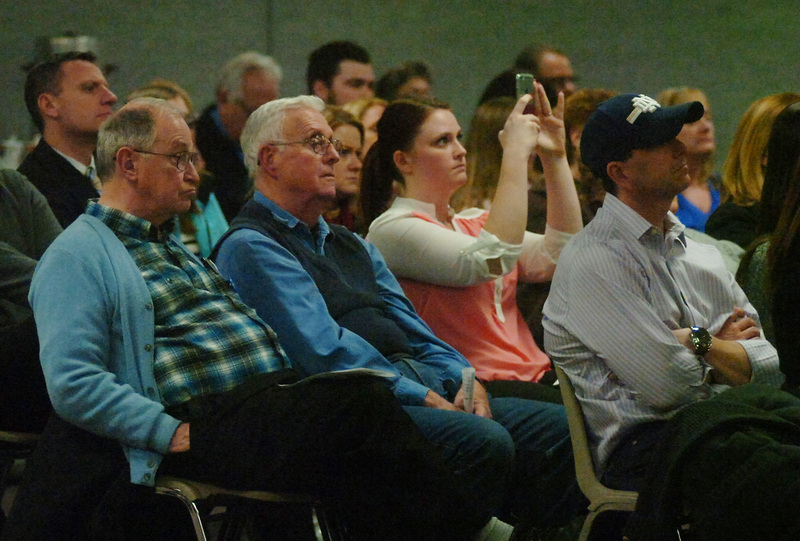 This event, funded by the Graham E. Smith Memorial Fund, brought approximately 200 people to the Costick Center, helping Farmington SAFE in reaching this goal. 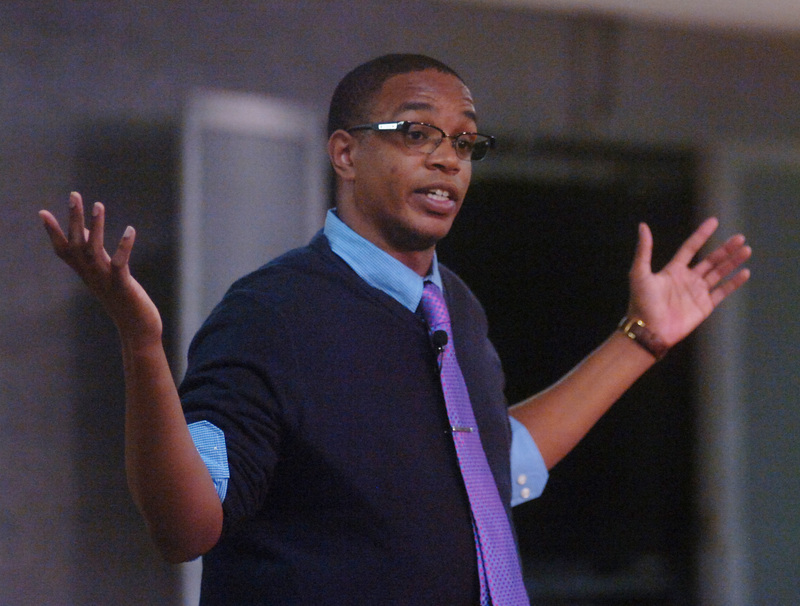 Jordan Burnham is a nationally recognized mental health advocate and motivational speaker. His story has been featured on ESPN, and in People and Sports Illustrated magazines. 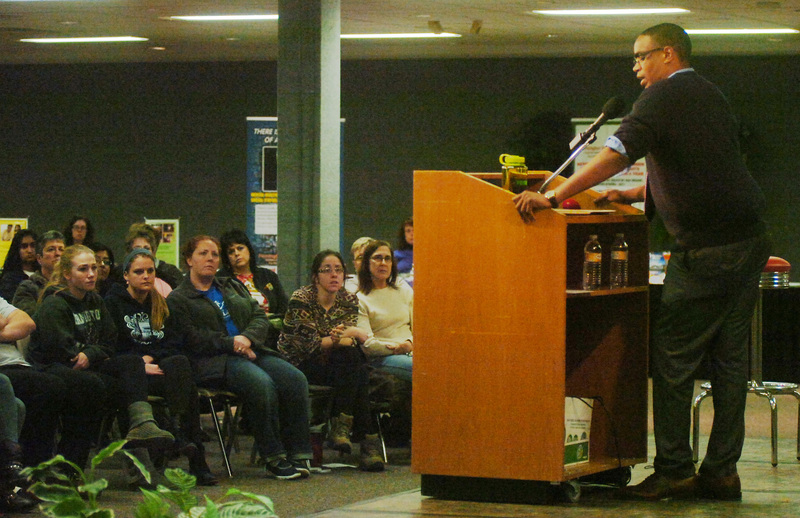 Jordan spoke of his experiences with depression, substance abuse and his attempted suicide during his senior year of high school. Before arriving at the Costick Center that evening, Jordan spoke to students and staff at University of Detroit Jesuit High School, and also Harrison High School, sharing his message of hope and survival to more than 1,200 people in one day. Jordan’s story is powerful. A popular student athlete who appeared to have it all, Jordan didn’t feel comfortable or safe sharing how he truly felt inside. “What do I have to complain about?” he thought. He felt alone. He self-medicated with alcohol. He attempted suicide. Jordan survived a nine-story fall from his bedroom window. His rehabilitation (both physically and mentally) was grueling, but he persisted and walked across the stage to receive his high school diploma the following year. Today, Jordan travels around the country talking to middle school, high school and college students about his personal experiences. During the question and answer portion of the Costick Center event, Jordan was asked how we can reduce the stigma of speaking up about suicide and mental health issues. He answered: “We need to share our stories.” He mentioned that if he had heard someone share a story like his when he was younger, he would have felt less alone and more likely to reach out for help. 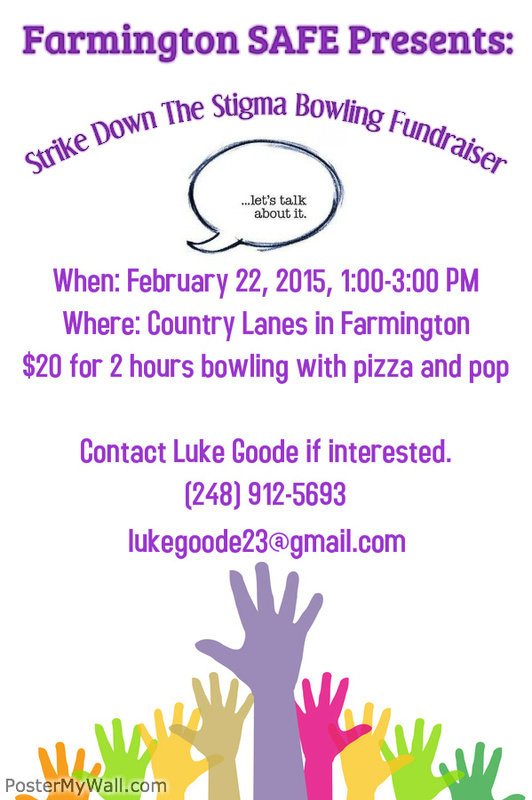 In Farmington SAFE’s logo are the words “let’s talk about it.” By sharing our stories, we are doing just that. We are “talking about it” and hopefully helping people feel less alone. 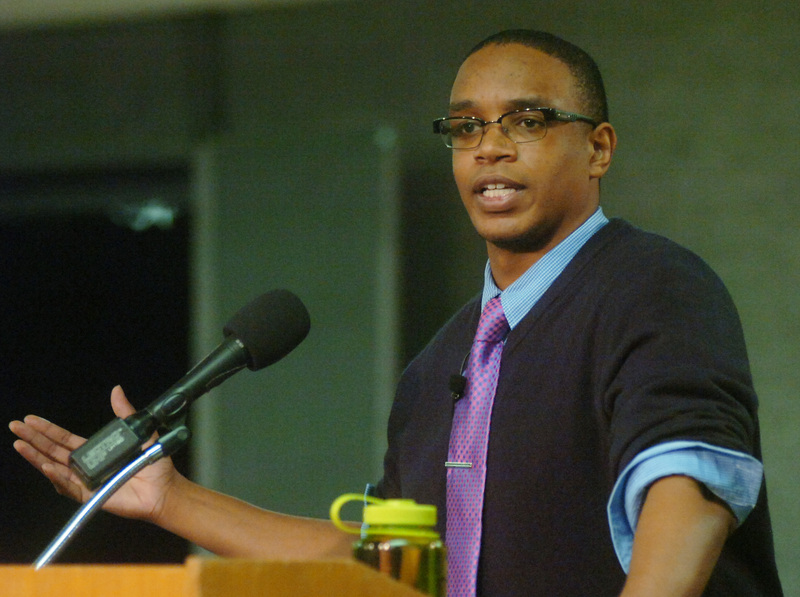 Thank you, Jordan Burnham, for sharing your powerful story. We look forward to your return. For further information about Jordan Burnham, check out www.activeminds.org and “E:360, The Jordan Burnham Story” on YouTube. For further information about FarmingtonSAFE, find us on Facebook or check out our website www.farmingtonsafe.com. 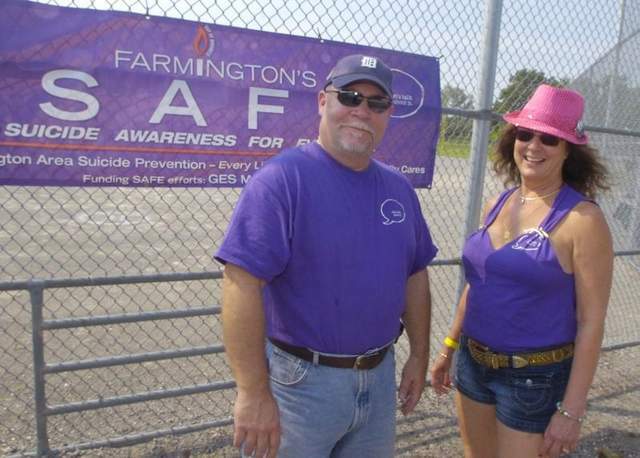 Anna Cassar & Sara Majoros are founding members of Farmington SAFE. Burnham is expected to return to the Farmington area thanks to a potential grant from the Farmington-Farmington Hills Education Foundation. 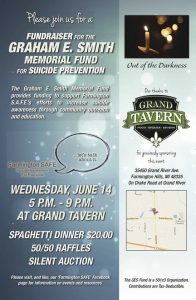 On Tuesday, January 27 from 7 to 9 p.m., Farmington SAFE (Suicide Awareness for Everyone) will host speaker and suicide attempt survivor Jordan Burnham in a special event sponsored by the Graham E. Smith Memorial Fund to be held at the Costick Center, located at 28600 Eleven Mile Road. Jordan Burnham has become an outspoken national advocate for ending the stigma about mental health issues and bringing the topic of suicide risks out into the open. Mr. Burnham will speak about his own recovery from depression, and discuss suicide triggers, as well as mental health issues that impact today’s teens. He is a strong supporter of desperately needed dialogue and open conversations about mental health. 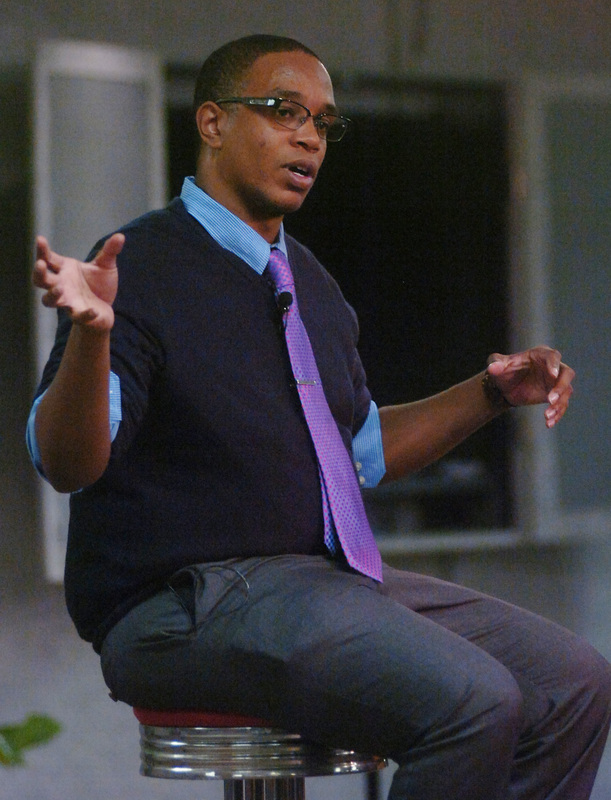 Jordan Burnham, who was profiled in People magazine, travels the country to share his experiences at colleges, high schools, and middle schools. He will speak to students at Harrison High School prior to his appearance at the Costick Center. Students, parents, educators, and mental health professionals from all over metro Detroit are urged to attend this important event on January 27. Doors will open at 6:30 p.m. for refreshments and visits to resource tables staffed by representatives from Common Ground, Botsford Hospital, Maplegrove Center, and other mental health support organizations. For more information, contact Mayor Pro Tem Dr. Ken Massey at 248-871-2500 or kmassey@fhgov.com. 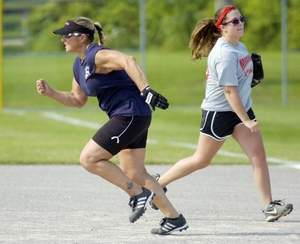 They gathered to play a day of softball to let community members know that, when life is a drag, no one is alone. “It was amazing to see all of the people come out. 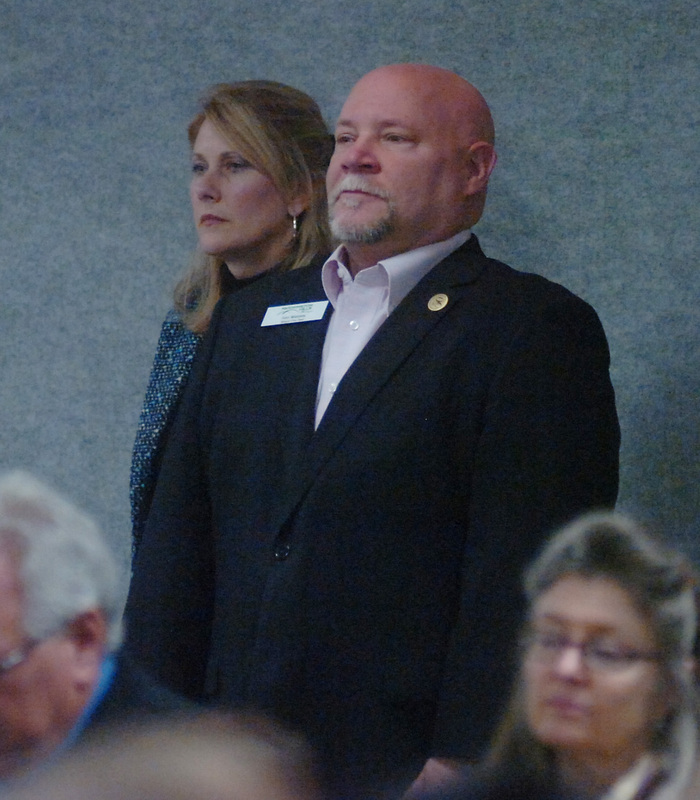 They knew why we were there,” said Farmington Hills City Councilman Ken Massey, a founder of Farmington SAFE (Suicide Awareness for Everyone) and the Graham E. Smith Memorial Fund. SAFE is committed to raising awareness about mental health and suicide prevention. 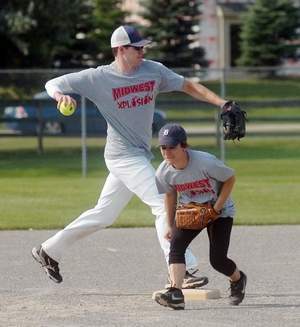 The memorial fund is used to help fund SAFE programs and activities, such as the softball tournament and picnic Saturday, as well as community conversations with topics relating to suicide and mental health problems. 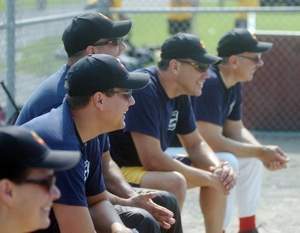 The event drew two teams from the Farmington Hills Fire Department, one from the police department, a team from Special Services Department and one from Farmington Public Schools, as well as former members — now adults — of South Farmington Baseball and Botsford Hospital, which was also a major sponsor. By day’s end, Special Services Department (parks and recreation) team members left the fields and the double-elimination tournament as victors. It was close though. Right up to the end, Farmington Hills Fire Department No. 2 team was neck-and-neck and an elimination game was in order. “The two teams played twice (to determine the winner),” Massey said. Along with the softball tournament, the teams and community members were treated to a picnic under a tent, as well as loads of information about mental health, bullying and suicide. The message delivered by the event was driven home Monday evening with news of former Bloomfield Hills resident, actor and comedian Robin Williams’ apparent suicide at his home in northern California. Locally, that’s what SAFE is all about, Massey said. Recently I shared thoughts on how we can change how our community deals with the issue of mental health and suicide. We have to deal with it; too many of our fellow citizens are dying because of our lack of ability to discuss the topic. According to the Centers for Disease Control and Prevention, over 38,000 of our fellow Americans will die this year by suicide. That is equivalent to a jet airliner with 200 people aboard going down every two weeks. Imagine the cry for answers from the traveling public if anything close to that were to take place. Great, so how do we start? 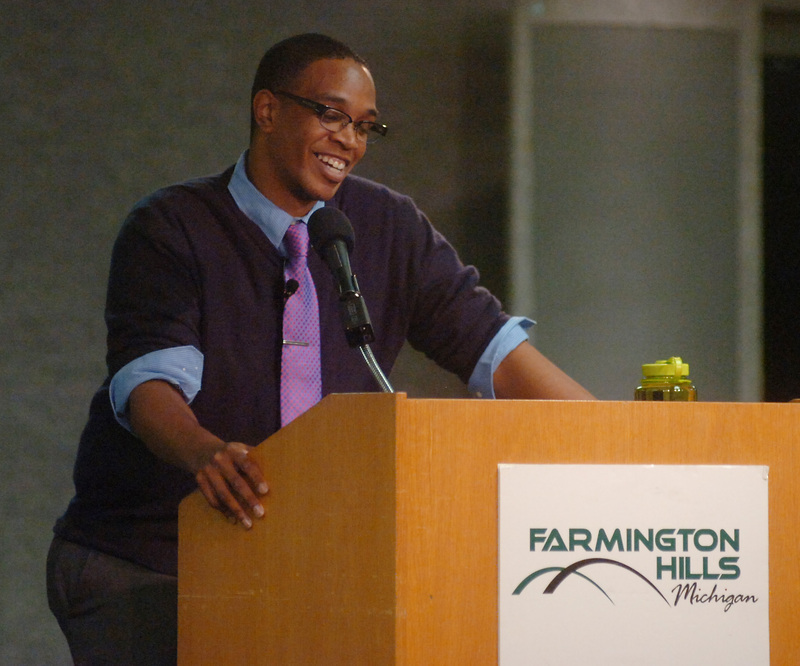 Our community of Farmington and Farmington Hills is going to take this on directly. 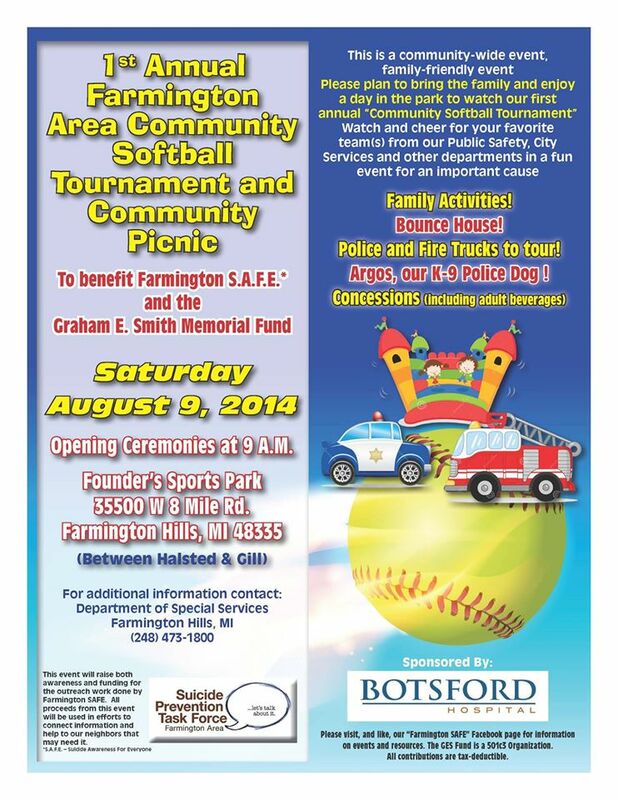 On Saturday, Aug. 9, we are hosting a community field day centered on a softball tournament. Our community teams from the department of special services, police department, fire departments, and Botsford Hospital come together to play in this tournament. The event, held at Founders Sports Park, will bring together teams to play softball, resource tables, and people who care. Two messages should emerge from this event. Number one: people who are hurting and need help are not alone. Their community cares about them and is dealing with this head on by coming together to raise awareness in this way. Secondly, in a family friendly environment we can change the dialogue by allowing our community members who have access to resources and who have kids realize that we can talk about this tough issue. I invite you to attend the event and, by your presence, make a statement that we, as a community, will not passively allow our fellow community members to suffer and be lost. As a community that cares, we are here, showing our support to change the dialog and the outcomes. Those in our community who are hurting can be helped, just by knowing they are not alone. 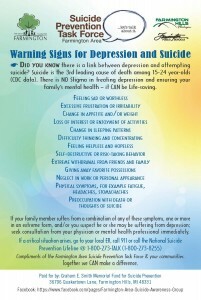 Those who have attempted suicide and survive, report how incredibly agonizing is the mental pain they feel. This pain is further complicated by the fact that they feel alone. We as a community, can deliver the strong message that, “you are not alone.” We want to help. There are resources in the community that can help you, and it’s okay to talk about it so that we can get that help to you. We are here to say, let’s move this topic out of the darkness because we, your community, want to help you. Much like the Susan Komen 3-day Walk — which raises awareness of breast cancer and raises funding for cancer research — our event centers around a physical activity, the softball tournament, and focuses around a fun sporting event. Our community can gather, meet our city staff, watch a game or two, kids can enjoy the bounce-house, checkout police cars and fire trucks, food and beverages will be available. This is a large community picnic and event, similar to the Fireman’s Field days I recall from my youth (Ok, I dated myself). Resource groups for mental health organizations, specialty needs, suicide prevention can provide information for the public. 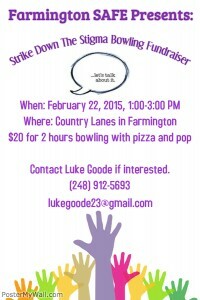 The event is planned to be fun, informational and supportive. 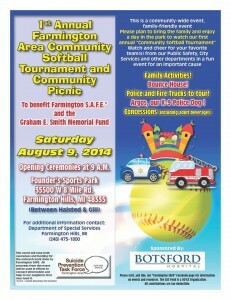 The event is at 9 a.m., Saturday, Aug. 9 at the Founder’s Sports Park off of Eight Mile, between Gill and Halsted. The Farmington Hills fire department will present the colors followed by the singing of the national anthem by a special young lady. Miss Farmington will lead the Pledge of Allegiance, and Fox 2 Detroit’s sportscaster Brian Ermanni will throw out the first pitch. Make plans to bring your family and join us for this event. Your presence is taking a stand and saying WE CARE. Ken Massey is a Farmington Hills City Council member and a founder of S.A.F.E., Suicide Awareness for Everyone. 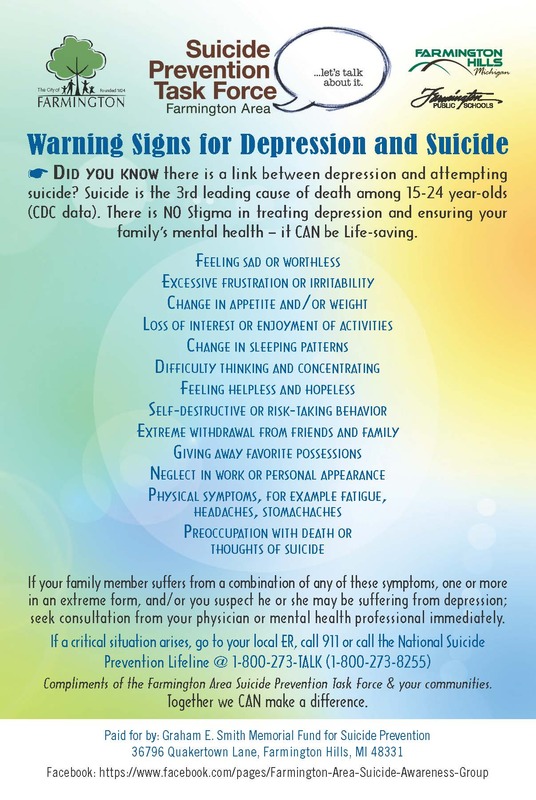 Farmington SAFE (Suicide Awareness for Everyone), the Farmington Area Suicide Prevention Task Force, will host a Community Conversation on Wednesday, September 18 from 7 to 9 p.m. at the Farmington HillsCity Hall. The topic of the group’s latest forum will be “Coping with the Aftermath of a Suicide Attempt,” focusing on how suicide attempt survivors and their families can heal and progress toward a hopeful future. The event is open to all members of the community. A panel of experts will address the following subjects – the medical, legal and psychotherapeutic processes set in motion by a suicide attempt; what changes to expect from a loved one who has attempted suicide; how parents can continue to care for themselves while helping their suicidal child; and how to access resources (therapists, support groups, and hotlines) following a suicide attempt. The Suicide Prevention Task Force is encouraging open dialogue about the impact of a suicide attempt on families, loved ones, colleagues, and the community. 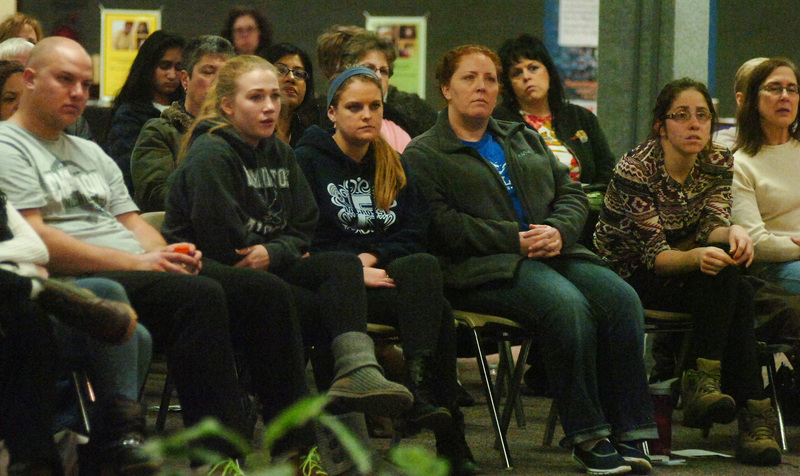 With a theme of “Let’s Talk About It,” the Farmington Area Suicide Prevention Task Force brings community leaders together to reach out to troubled individuals and counteract alarming trends in suicide and suicide attempts. Farmington Hills City Council Member Dr. Ken Massey, who lost his son Graham E. Smith to suicide, has spearheaded efforts to remove the stigma and bring the topics of depression and suicide out into the open.